Building a strong and lasting customer relationship is one of the easiest ways of providing great customer service and a first class client experience. It is also one of the simplest ways of retaining loyal customers for years to come. After all, it’s far easier to grow your customer base with loyal past customers than it is to find new clients in the future! So here are my five simple ways to boost your client relationships and therefore boost your customer base. We’ve all interacted with a glassy-eyed company representative with the personality of a baked potato and I think we can all agree that it’s not the most inspiring of experiences. Your job as a photographer is to inspire, motivate and be the driving force and enthusiasm behind every project, and the best way to achieve this is to act like a human being. More often than not clients want to interact with a person who shows some emotion and a bit of personality, rather than a formal company voice on the other end of the phone. So be friendly and outgoing, make polite conversation and smile warmly. One of the best ways to build a lasting customer relationship is to get to know your client well. This doesn’t mean you should ask lots of personal questions and act like best buddies, but taking a genuine interest in their life and background is a good way to start. This will show your customer that you consider them another human being not just another project number. Our 10 Quick Tips for Great Client Meetings will give you some great ideas for starter questions. We all like to feel remembered and as if someone is thinking of us so stay in regular contact with clients via email and phone calls. These messages shouldn’t be over the top or intrusive but occasionally dropping a line asking how things are or bringing their attention to an offer they might be interested in will make clients feel special and valued. No client wants to know about the bad journey you had to their house or how tired you are. Clients want to feel valued and appreciated, knowing that you are going to provide a pleasurable experience, so make sure you’re upbeat and happy (even if you’re tired). A loyal client is worth their weight in gold and often send more business your way, so why not say thank you with a reward? These don’t have to be extravagant gifts but a little something, such as a gift voucher for a local coffee shop or a discount off their next booking, will go a long way. Speaking of which, we would like to thank all our loyal customers through our referral programme. If you refer someone to theimagefile you will be rewarded with a free month and an extended trial for the person you refer! Simply tell your friend to sign up and to write your name in the promo code box on the sign up page. After that everything will be handled for you! 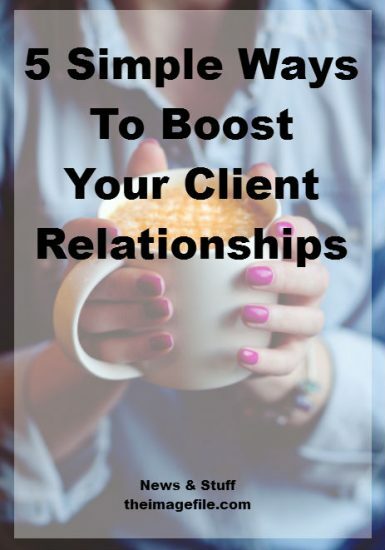 How do you boost your client relationships? Do you use some kind of reward system to thank loyal customers?